I was given some "bricks" at the Derby Teslathon. ("bricks" are large transistors, IGBT's to be precise.) These ones are Powerex CM300HA-24H. Each one can handle 600A (pulsed) at 1200V. As they will not switch toofast, An OLTC was an ideal coil for them. 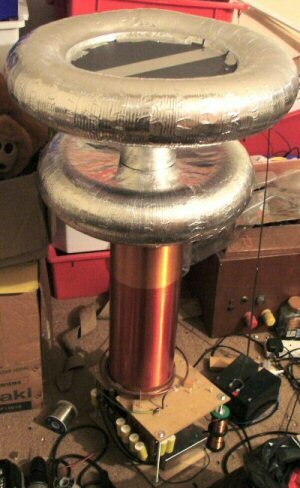 The coil was designed by using my OLTC calculator , from this and available parts I decided on a 6" diameter secondary 20" long wound with 0.2mm wire 2200T. 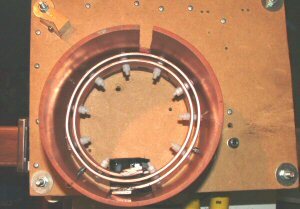 The Primary is two turns of 20mm x 3mm copper bar, wound around the 6" former. Each turn is insulated from the other by two layers of overhead projector film. 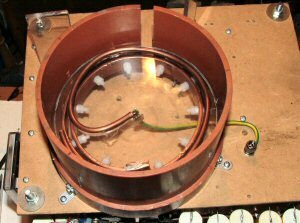 The primary caps are placed on double sided PCB so that adjacent ones are wired in opposite directions, this keeps down stray inductance. The two IGBT's are nounted onto a 200mm x 150mm x 40mm heat sink , kept cool by two 80mm 12v fans. 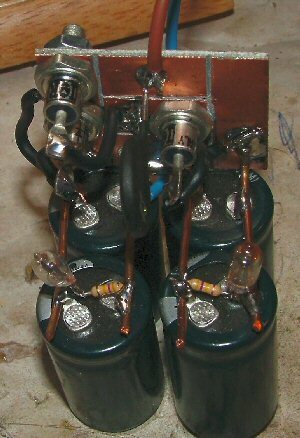 The rest (8) of the primary capacitors are mounted on this side. The power for the OLTC comes from a voltage doubler, 2 x 16A 400V diodes and 4 x 100uF 500V capacitors. The Third diode here is the de-queuing diode for the charging inductor. this give me a total charging voltage of about 950V @ 2KW. 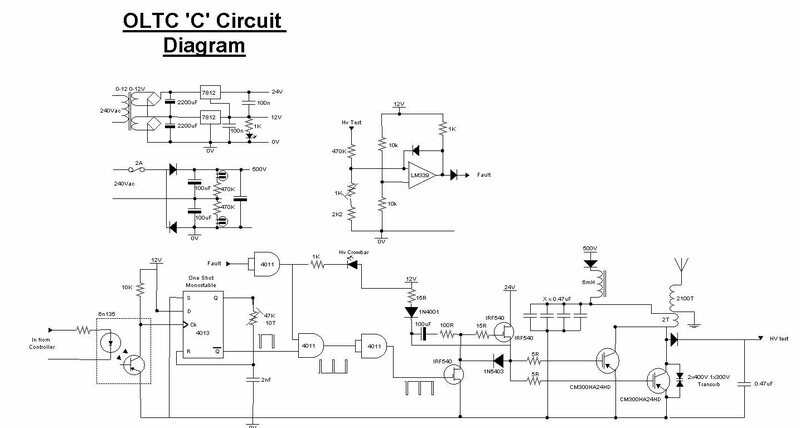 The IGBT Drive, is designed to run from a single output of the AD-OLTC controller . 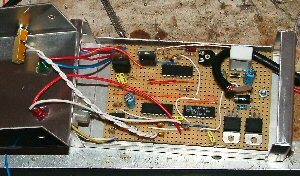 The pulses are fed in to this control box from the IGBT drive of the AD-OLTC controller via an Opto. This allows me to isolate the controller from the voltage doubled supply. The Base, wired up and ready to go. 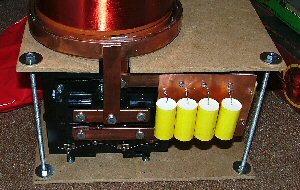 "Made like a brick OLTC"
Click image to see coil from the other side. I First started with 24V charging tha caps. Every thing ran fine and I set the quench at the end of the ring up (2.5 Cycles). With 24V in I was getting about 1/2" arcs to an earthed rod. A regulator had touched the earthed case, blown holes in the earth track, and blown all of the driver electronics, and one of my precious bricks. OH F^&K !!!! Luckily, I had a friend with a spare brick, So I replaced all of the driver and the blown brick, and started again, checking VERY carefully. SPARKS!!! 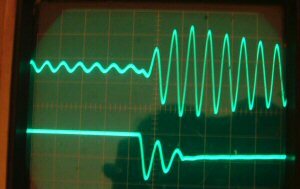 16" at around 100Hz with no problem at all..
A picture of the secondary (to air) voltage against the primary capacitance voltage. The tuning is about right. I do seam to have no sharp tuning point, but maybe I need to use smaller caps to hit the resonant peak, At present I'm changing the capacitance by adding or removing 0.47uF's or two in series to make a 0.235uF, The coupling is about right with ring-up in 2 Cycles. 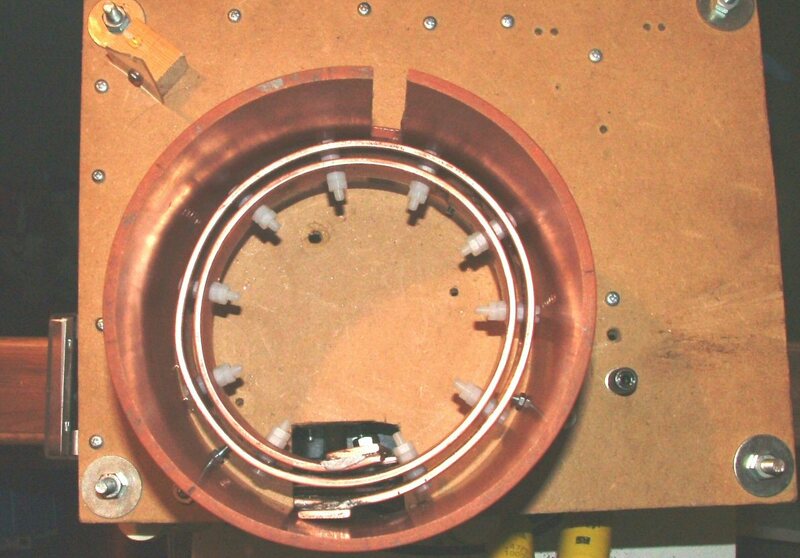 In an attempt to get more primary capacitance I made a couple of toroids from ducting, pie tins, frisbys etc. Top one is 4"x20" and the bottom one is 4"x18"
This gave me about 1.5uf more than the sphere did on its own, but I've still got disapointing sparks. At max 2' this is limited by spikes shutting down my over voltage protection cct, especially when you get a fat arc to earth. 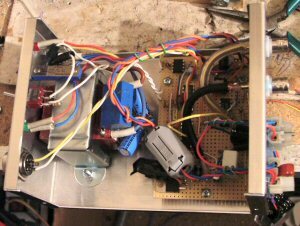 In an attempt to stop arcs from tripping the overvoltage trip I have enclosed all of the driver electronics in an ALU box. Whilst rebuilding the drive I have added a 15A relay to disconnect the main power if the HV trip goes. I found that it was possible at a low input voltage and high BPS to have the HV trip go, but not enough power for the 6A breaker to trip. this left the variac and voltage doubler power driving a dead short!! 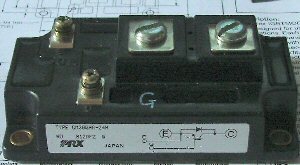 The IGBT drive signal and the HV detect are fed via coax to two BNC connectors. The two chock blocks are to drive the fans and the new relay to turn off the power when the HV trip fires. 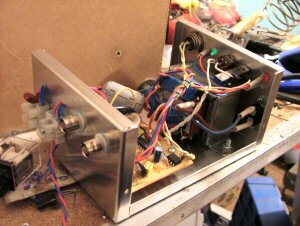 The mains in goes via a 0.9uF filter cap, and the fans and relay are decoupled by 0.1uF on entry. 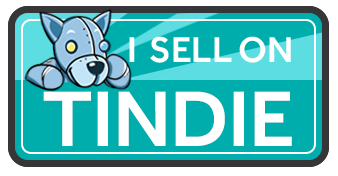 Inductive filters may be added later too. Ikea have started to stock large stainless steel salad bowls again, so I bought two of the 13" ones to give me a rather snazzy looking sphere. 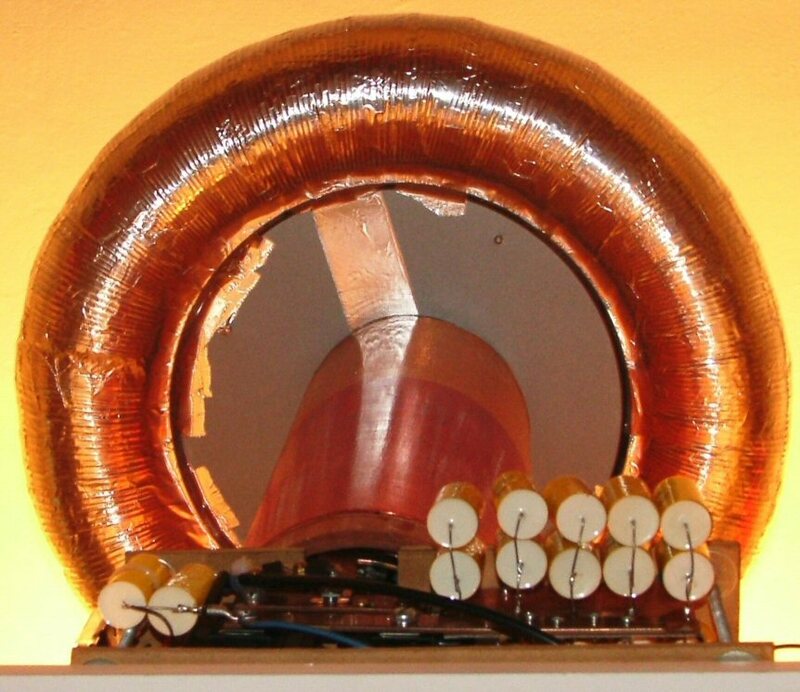 This has the same capacitance as the two ducting toroids above. I manages to power up the coil with a breakout to air and keep going until the 6A trip went, about 26" arcs to air, and it didn't trip the overvoltage. When I tried the same trick to earth, it poped immediatly after a single strike, so I still have something to look at. I think some of the problem is my rather lousy earth in my attic, I dont think its up to 1.5KW of RF being pumped through it!! Undeterred I have replaced the 6A trip with a 10A one, and I'm now waiting for a trial with a decent earth. Probably at the Cambridge Teslathon. At Cambridge the coil worked really well to air. Unfortunatly no one took any photos and I had my hands full with BPS and variac. 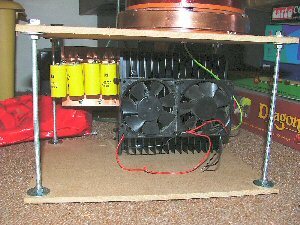 I managed to power up the coil with a breakout to air and keep powering up until the 6A trip went (1.5KW), about 26" arcs to air, and it didn't trip the overvoltage. When I tried the same trick to earth, it poped immediatly after any single strike greater than about 12", so I still have something to look at. As the February Gaussfest was coming up, I decided to have another go at getting more out of the coil. I managed to persuade my wife to let me use the kitchen table as a test bed, giving me much more room than the attic. I re-wired the screening on the driver case to use 0V rather than mains or secondary earth and re did the screened cables to the 0V pickup from the bricks, leaving much less unshielded than before. I also found that if I lowered the whole of the top platform on the studding, I could lower the secondary without moving the primary this gave me the ability to increase the primary-secondary coupling. So next test at the Gaussfest. 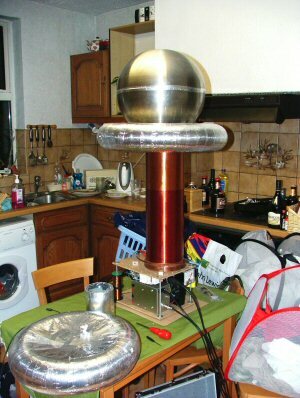 The Coil ran Ok at the Gaussfest, but still not much improvement on 2.5'. 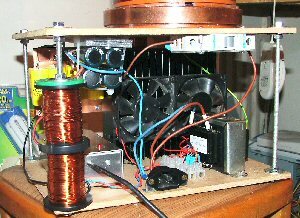 I did manage to run at full power 2.4KW (10A at 240V) which proved the electronics can stand abuse. So after the Gaussfest I started to look at ways of increasing the bang energy. This pretty much came down to lowering the primary inpedance. I also raised the primary up by about 12mm so the base of the primary is now level with the base of the secondary. This should give me more control over the coupling. The Inner of the secondary is drilled so I can adjust the exact height of the secondary RWT the primary. I have also added a strike rail inside the secondary in an attempt to catch any internal arcs before they contact the primary and upset my bricks. 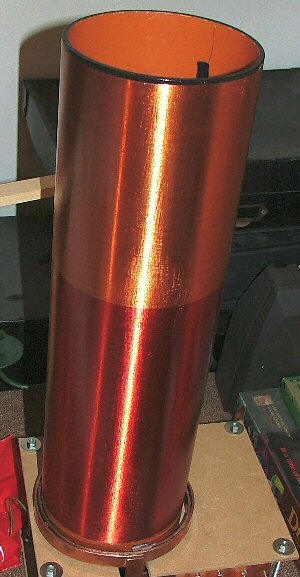 This is a spiral of 5mm copper pipe on a disk of 4mm acrylic placed over the primary coil. The OLTCII ran quite well, but I had all sorts of problems, Mostly due to interferance when arcing to earth tripping the over voltage trip. After a lot of rebuilding and screening, I decided to replace the controller cables with an optic fibre. The improvement was huge, I could arc to earth with no problems. But of course that wasn't the end of the problems. I now had a strange "PING" sound at high powers, and this did blow the HV trip Eventually I pinned this down to being an arc forming on the inside of the secondary. Again after a lot of playing, I found that this was racing sparks. Lowering the coupling sorted out this problem ans I had another session in the testing room (the kitchen). 45" Sparks !!! !